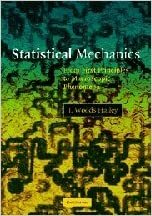 Based on the author's graduate course taught over many years in several physics departments, this 2006 book takes a 'reductionist' view of statistical mechanics, while describing the main ideas and methods underlying its applications. It implicitly assumes that the physics of complex systems as observed is connected to fundamental physical laws represented at the molecular level by Newtonian mechanics or quantum mechanics. Organised into three parts, the first section describes the fundamental principles of equilibrium statistical mechanics. The next section describes applications to phases of increasing density and order: gases, liquids and solids; it also treats phase transitions. The final section deals with dynamics, including a careful account of hydrodynamic theories and linear response theory. This textbook is suitable for a one year graduate course in statistical mechanics for physicists, chemists and chemical engineers. Problems are included following each chapter, with solutions to selected problems provided.